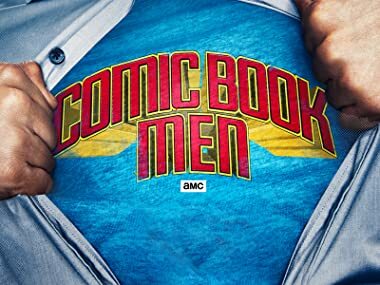 Comic Book Men - a tribute to the collector returns for a second season. Watch Kevin Smith and his crew of fan boys turned pop culture experts live, work and breathe comic books. Walt and the guys decide to throw a birthday party at the Stash. One customer comes in with a larger than life Darth Vader helmet. The guys head to a local auction with a wager on the line. One customer learns that mixing cigars and comic books never works out. The guys hunt for the Jersey Devil. One customer tries to sell his Thundercat figures, and finds that loose items aren't always popular. With Walt and Mike sick, it's up to Ming to run the Stash by himself. A customer comes in to sell first issues of Iron Man and Daredevil. To unload their inventory, Ming organizes the Stash to join in on the local sidewalk sale. Walt sells some early Teenage Mutant Ninja Turtles comics. Mike and Ming participate in a 5K zombie run for Kevin's charity. Walt buys an unusual item containing signatures from the 1966 Batman TV show. Kevin visits the Stash for a book signing and brings Jay along for security. A customer brings in original artwork from a beloved franchise. The guys get ready for a visit from Stan Lee. Walt has a chance to buy the most valuable comic book written in the last 20 years. The Stash will sell an independent comic book in order for the guys to see a costumed MMA fight. Walt buys a couple pairs of nostalgic underwear. The guys compete to make the best sandwich to represent the Stash. One of the world's most valuable comics comes web-slinging through the door. Walt negotiates for an original Asteroids arcade cabinet, but another customer has his own plans. Ming gets excited for GI Joes from his childhood. The Stash organizes an auction to help a friend sell his collection. A customer relates to one of Spider-Man's deadliest enemies. A customer tries to sell a popular gaming system with an unusual twist. Ming buys another piece of his childhood back. The guys try their hand at creating their own comic book. Walt, with the help of pop culture expert Rob Bruce, buys a signed issue of Creepy. The guys pass the time with a game of charades with a comic book twist. Walt has a chance to buy original artwork from his favorite artist. Ming plans a surprise for Walt's 15th anniversary at the Stash. Walt teaches Ming the virtue of patience when selling a Giant-Size X-Men #1.